You’ll be glad to hear that icy hatred has melted in our house. Meanwhile, we’re glad that it’s finally heating up around here! This year is the first year I’m not throwing a large lump sum at the Town of Niskayuna. Both daughters have decided that they’re done with town camp, except possibly as counselors later. I’m a little sad about that. Cheap as heck and within walking distance of our house, it was a great way for the kids to have fun while I got things done in the mornings. Luckily, they’re independent enough now that I can leave them at home while I run to the grocery store. I can’t help but be a little wistful, because it’s the end of an era. It’s also the end of the Era of the Town Pool. We’ve been loyal members for years, and the kids have grown up there. 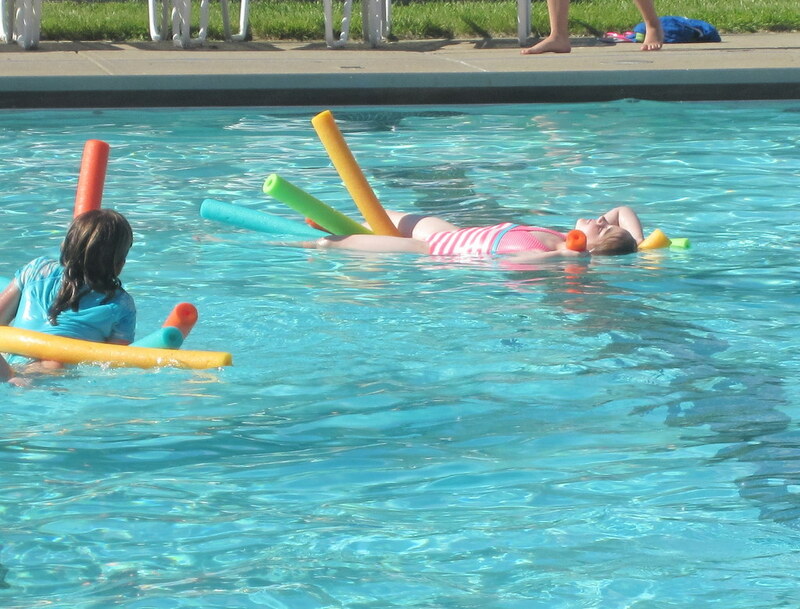 But during the spring I started checking my kid’s favorite people to hang around with against what I knew about local pool hangouts, and I realized that they have more friends over at the Schenectady JCC. To make it more dramatic, my friend/mom to J’s BFF had become an indoor member at the J over the winter, so she was considering the outdoor membership as well. Now, here’s the deal: M will find some way to entertain herself, but if J doesn’t have a friend, she will alternate between climbing into my sweaty lap, asking for another snack, and asking me to swim with her. Now, I enjoy a good lap-sit or swim or snack, but two or three hours of it in a row, and I’ll start to get fussy, and next thing you know, I’ll have a tantrum. So the surest bet to Optimum Enjoyment for Mom is for my kids to have friends who will entertain them while I chit-chat or read on a chaise lounge. 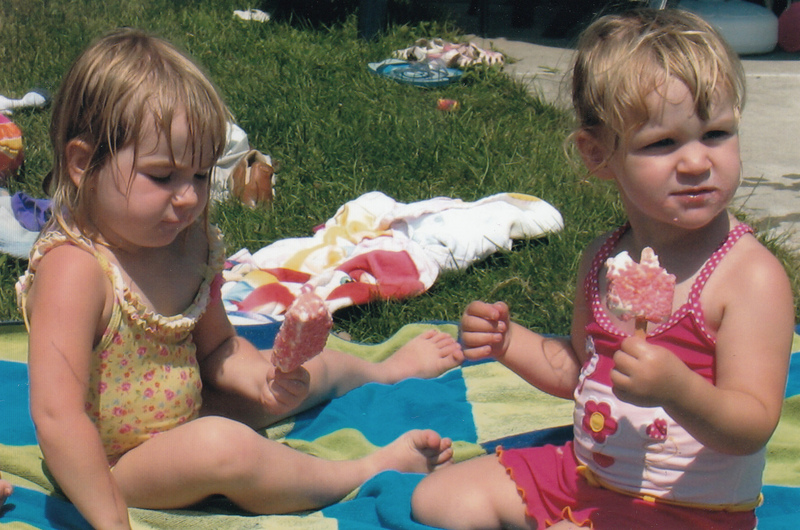 So for weeks we were wavering, largely because I wanted to ensure that J and her BFF would be together. M was advocating the JCC, because she’d visited often with friends and preferred it for the pool itself and the kids she’d find there. J was leaning Town, because it’s been such a big part of her summer every year. Finally, one day the BFF and her mom and J and I went to visit the JCC pool. I was surprised to hear that they’d never been to the pool, so they’d decided to check it out and come to a decision already. My friend loved the bigger pool and wide-open spaces, and another friend who’s a member answered our many questions, while J and her BFF watched their friend splash in the pool. Then J and her BFF headed over to BFF’s house, where they planned to have some dinner and create a definitive Town vs. JCC Pro-Con list. That night, I asked J about their verdict. “Everyone wants the JCC, and it had more Pros,” she responded softly. Oh, my gosh. She was adorable. It was heartbreaking. So we talked about changing and making new memories and visiting old places, and she agreed that the new pool might be fun, too. 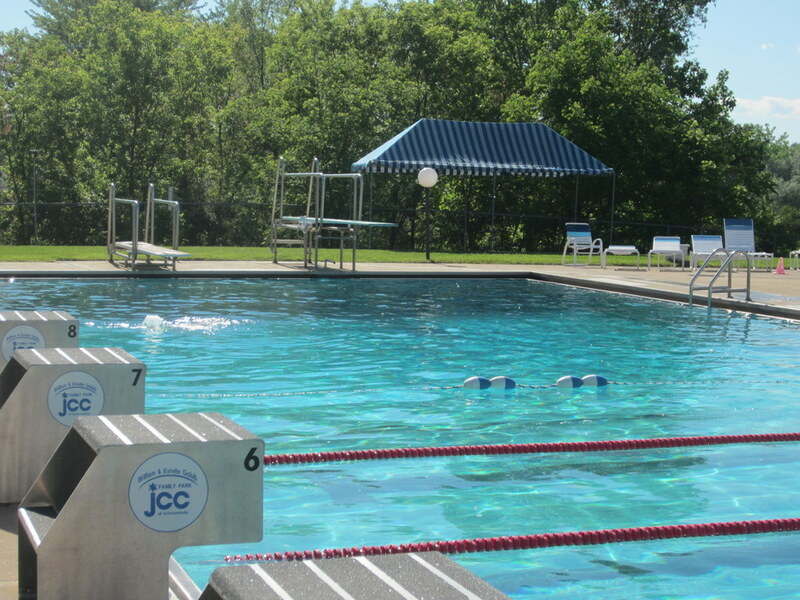 We talked a little bit about the Pros that made the JCC the winner: kids are allowed to swim in the deep end even when they’re not going off the diving boards, and swim lanes are set up at all time, so there are no “adult swim” breaks like at the Town Pool. Another perk was that the pool was open earlier in the season, so we were able to go swimming weekend before last, when it was so warm and sunny. Oh, and the water’s warmer! We all liked that. They kept pointing out little amenities and making plans for the summer, so those nostalgic tears are over. The girls were also pretty excited to find out that the snack bar includes fried dough. For the mothers, this seemed like a bit of a Con: honestly, who can enjoy fried dough while wearing a swimsuit? 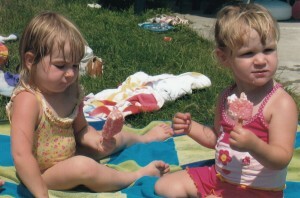 Which reminds me, if you go to their Facebook page, you might even catch a picture of Cute W and I lounging on chaises. After Cute W’s visit he declared himself strongly pro-JCC. Yes, I’m going to miss a few mom friends, but overall, it feels like more of a vacation than the Town Pool did. And I’m very excited that it’s closer to our house, which makes biking there easy and fun. The only tweak my friend and I want to make is to see if we can get a trashy magazine exchange going somewhere–that was one of our favorite pool activities, so we’ll see how it goes. Ah but with the initiation fee the JCC is twice what the town pool runs. Us poors will miss you this year 8-(. @Aliza & Matt–yeah, I know. I’ll miss you guys! Okay, I even teared up at that blast from the past. Our babies are growing up!! 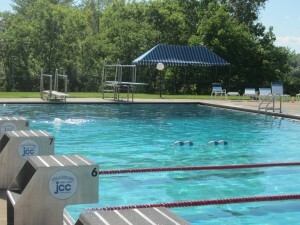 @Matt There is no initiation fee to join the outdoor pool at the JCC. They only charge that for indoor memberships.